Welcome to the movie that’s going to be paying cinema staffers their year-end bonuses, the world over. The critic-proof phenomenon that’s had audiences – yes; even staid South African ones – applauding as the end credits rise. The theatre-filling behemoth that’s had members of the public – yes; even staid South African ones! – turning up at afternoon screenings in full wizardly regalia. There’s nothing I could do – or would want to do – that would dissuade passionate Potterites from turning up at the cinemas in their droves to see this noisy, climactic final chapter of this young wizard’s adventures. Normally, sequels of popular movies try desperately to replicate the look-and-feel of the original film, but, to the credit of this franchise, each new episode has progressed (invariably in a darker, scarier direction). I suppose that the kudos here belong to the original books upon which they were based (and not “on” which they were based, despite that grammatical lapse in the film’s closing credits). I’ve enjoyed spending this last decade with Daniel Radcliffe and company, although I’m not an out-and-out Potterite, so I’ve required assistance from time to time with the convoluted plot and mystical terminology. And what did I think of this concluding part? A bit too dark (visually speaking) for a 130-minute film. Otherwise; noisy and filled with action and excitement. As expected, there were a few special, quiet moments that had the fans reaching for their tissues. And let’s not forget the stellar cast of British thesps that no film without a budget this size could dream of attracting. 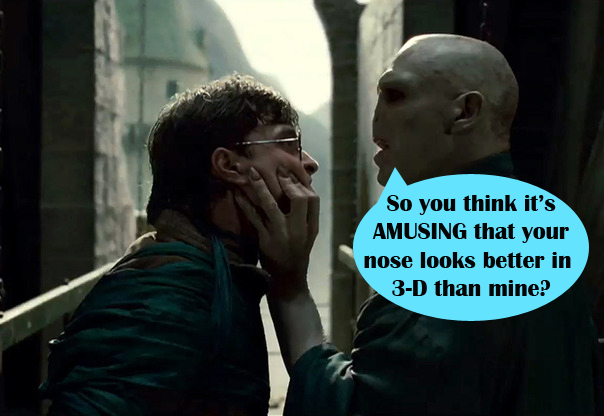 And the conversion to 3-D? OK, on the whole. Some dodgy moments here and there, and let’s not forget that faked 3-D is rarely the equal of stereoscopically originated material. My favourite moments of the film lay in a brief sequence showing the trio of Radcliffe, Watson and Grint as middle-aged parents, and proving that even a supernatural education at Hogwarts can’t help one against the ravages of time. And, speaking of the passage of time, every now and then during this film I spared a nostalgic thought or two for the original Harry Potter film, with its sunny skies, flying Anglia, and raucous games of Quidditch. But that was yesterday and we were all younger dogs then and there’s nowt to be done about it, so, as the sun sets on Kings Cross Station, we bid Harry and his magical mates a fond farewell. It may have occasionally have been complicated telling a Grindlewald from a Slughorn, or figuring out whether Snape was a goodie or a baddie, but it has, on the whole, been quite an adventure! This entry was posted on July 14, 2011 at 1:58 am and is filed under 3-D MOVIES, Active3D Movie Reviews. You can follow any responses to this entry through the RSS 2.0 feed. You can leave a response, or trackback from your own site.